Alex Palmer was a young goalkeeper who came to us on loan from West Bromwich Albion on two occasions. 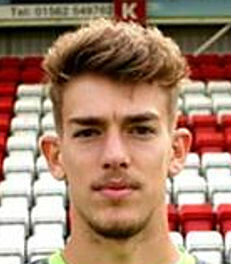 Alex is Kidderminster born and has been with the Baggies since the age of fifteen. He has never made an appearance for the Albion but was on the bench for their final game of the 2014-15 season at Arsenal. In November 2018 he went out on loan to Oldham Athletic as emergency cover.